Ready for something else sweet from me? K, good. 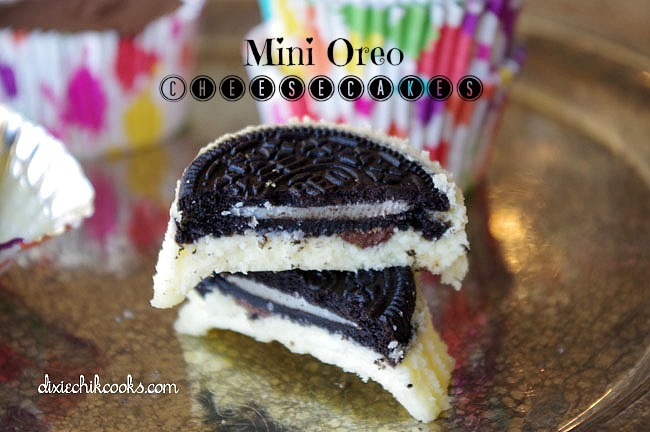 These little pretties are a combo of the world’s most perfect cookie and cheesecake. It’s like they got married. But cheesecake is a little clingy, so I don’t see a divorce in their future. I’m just wondering – does anybody ever get tired of Oreos? I can’t buy one package of the damn things without both my kids and husband all hiding it from each other in crazy random spots in the pantry. My husband is a big kid when it comes to cookies and cake. Oh, and ice cream and most types of candy. And gum…he swallows his gum – isn’t that gross? Wonder if he have a big sticky ball of gum stopping up his intestines. I know, ew. Bless his heart. 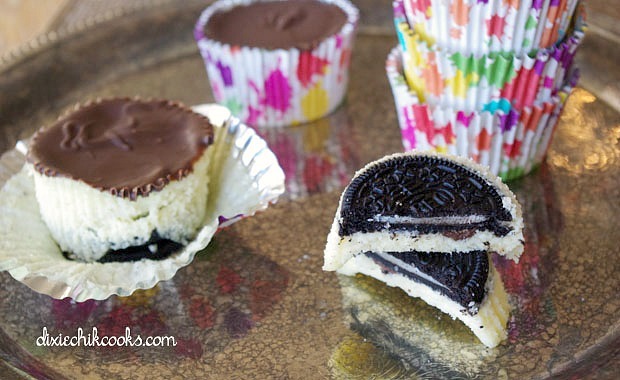 You can top these with melted chocolate if you want – I did half with and half without. Combine cream cheese, sugar and vanilla in the bowl of a stand mixer and beat on medium just until combined. Add one egg at a time, beating in between. Scrape the sides of the bowl down with a spatula and add sour cream and salt; beat until incorporated. 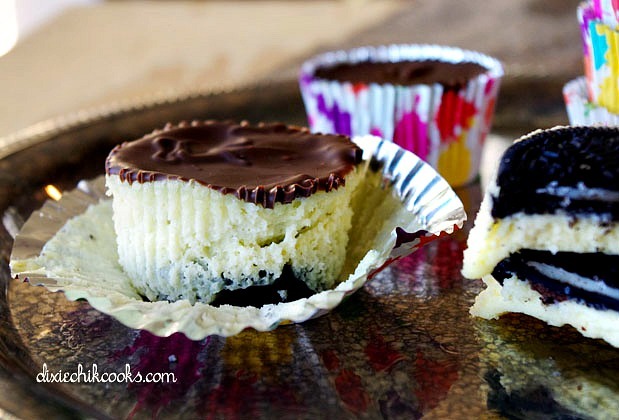 Add one Oreo to the bottom of each muffin cup and spoon enough of the batter over the cookie to fill it almost to the top. Bake for 20-25 minutes, or until the cheesecake has set. To make the chocolate, add the chocolate chips and the shortening to a microwave safe bowl and microwave in 30 second increments, stirring in between, until melted. Dip the tops of the cheesecakes in the chocolate, or drizzle it.